Primate Elijah Ayodele, founder and spiritual leader of INRI Evangelical Spiritual Church, says there would be dire consequences if Senate president Bukola Saraki refused to contest for presidency in 2019. 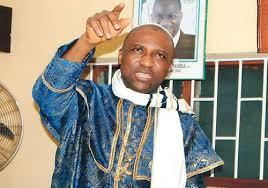 Primate Ayodele revealed this during the weekend while speaking at the dedication of an ultra-modern auditorium in Isheri-Olofin Lagos. The cleric stated that God wants to use Saraki to fix Nigeria. He said: “God wants to use Saraki for something big in this country. “He wants to use him to fix so many things. So, he has to come out and join the race. Owojela’s Blog reported that Saraki’s special adviser on media and publicity, Yusuf Olaniyonu, regarded news of his principal running for president as false. Reacting, media mogul Dele Momodu described the statement rebuttal as a charade.